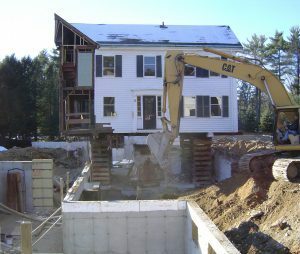 If your home seems to have a crumbling foundation, don’t panic. Whether the problem is relatively simple or something more complex, there is probably a solution available. Basement foundation repair is a common contracting specialty, and licensed, professional help is often just a phone call away. The first sign of a problem with your foundation may be evident upon visual inspection of your basement. You might notice chipping or flaking in your foundation, and there may be a new or expanding crack in the concrete. If your home is an older dwelling, its foundation may be made of brick or stone instead of concrete. You might notice disintegration of the mortar between the material, and your interior walls may even start to sag. At first, the concern may just be cosmetic. Over time, however, more serious problems may develop, including water leaks and eventual structural damage that can compromise your home’s structural integrity. Also, even if the problem seems minor, your home may not pass inspection should you decide to sell. Taking action to mitigate a crumbling foundation at the first sign of potential trouble can save you money in the long run. Foundation repair is a facet of home maintenance where Benjamin Franklin’s old adage often holds true. “An ounce of prevention is worth a pound of cure.” Thankfully, there are many options available. These include using epoxy resin or polyurethane foam to repair internal cracks, chipping out and replacing aging mortar and/or reapplying waterproofing sealants. When more extensive intervention is necessary, solutions may include exterior excavation, structural repair and perhaps repouring concrete. If your foundation seems to be crumbling, a trained and licensed professional can help you identify the cause and scope of the problem and then determine the least invasive, most cost-effective course of action. Then, you can take the steps necessary to give your home a solid foundation for many years to come.